Springtime is just around the corner. That means it’s time to hang that heavy coat up in your closet and get ready for some warmer weather. The Bethesda, MD area is filled with all sorts of shops and boutiques – some of which are major national chains and others are locally owned and operated. The shops at Bethesda Row offer the perfect variety of shops, ranging from apparel to jewelry stores, all the way to eyewear shops and skincare boutiques! 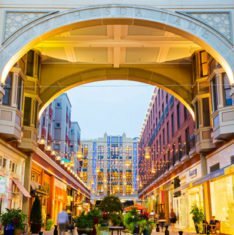 Whether you need to get a jumpstart on your springtime shopping spree, or you’re simply looking for places to window shop, here are the places you can do some serious shopping in Bethesda Row. Lou Lou started in 2004 as a local shop in Middleburg, VA and has since grown into a notable East Coast chain that has now found its way to Bethesda Row. If you’re looking to stock up on stylish accessories that come at a price that won’t break the bank, Lou Lou is for you. Whether you need some fresh, unique jewelry or you are looking for a new purse or wallet to use on a night out, you’ll be sure to find something to add to your wardrobe. A Bethesda shop that is sure to have your new favorite spring dress is Sassanova. 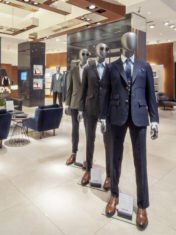 This unique boutique has only two stores, one in Bethesda and the other in Baltimore, so you will be able to find clothing and accessories that others won’t find in the big national chain stores. Sassanova prides itself on bringing in the latest trends and designer clothing, and their store associates are always happy to lend you a helping hand. chino also offers stylish everyday apparel like chinos and springtime button downs. So whether you need to grab a brand new custom suit or your next favorite pair of chinos, look no further than Bethesda Row’s Indochino. The only eyewear shop in Bethesda Row is none other than notable Warby Parker. Founded in 2010, Warby Parker aims to offer designer eyewear at an affordable price while still being fashion-forward. If you think it’s time to update your glasses, or if you are looking to add a few more pairs to your wardrobe, Warby Parker’s Bethesda Row location has tons of glasses and sunglasses to choose from. They even offer measurement and adjustment services, so if your frames don’t fit perfectly, they have opticians that can adjust them for you. Since 2007, Bonobos has offered great-fitting men’s clothing, shoes, and accessories through their online store. It wasn’t until recently that they now offer guide shops for their customers, a place where shoppers can meet with a guide one-on-one and try on their apparel to get a feel for how it fits before purchasing anything. With springtime approaching, it might be a good time to pop into Bonobos and see what their experts have in store for you! If you’d like to book an appointment, you can do so here. Looking for a skincare, haircare, and makeup shop in Bethesda Row that has all your beauty routine needs? Look no further than Bluemercury! The beauty and health store is staffed with experts that can help answer any questions you may have about best hair care products, skin treatments, or makeup tips. 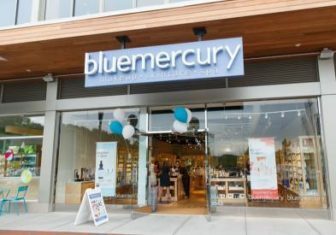 Bluemercury in Bethesda Row also offers relaxing spa services, including oxygen facials, peels, and microdermabrasion. So, after a long day of shopping, make sure to book your spa treatment at Bluemercury! Whether you need a new pair of lenses, or you’re looking for a springtime upgrade to your wardrobe, look no further than the shops at Bethesda Row! Can’t make the trip to Bethesda Row? These local shops in Bethesda might have what you’re looking for! And if you worked up an appetite after all that shopping, don’t miss out on all these delicious Bethesda Row restaurants!